It has proved to be a busy first few months for Rhiannon. She reported from Davos on allegations made in America against Prince Andrew, went to Japan to follow Prince William and most recently travelled to New Zealand on a tour with Prince Harry. She says that broadcasting live on the birth of Princess Charlotte was “an amazing buzz”, while securing a world exclusive interview with Prince Harry, about his future away from the army and his desire to have children, proved to be an enormous scoop. 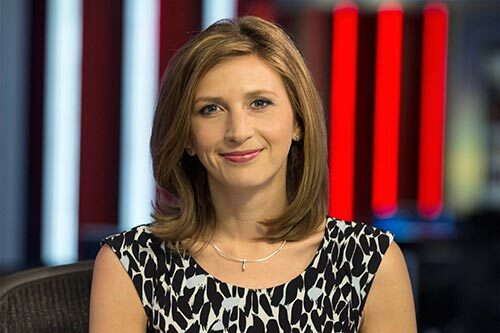 After completing a History degree at Leeds University in 2001, her postgraduate course at City gave Rhiannon the chance to focus on her ambitions to enter journalism. Media law training was essential and she gained great contacts in the industry. Her first full-time job was at Hereward FM and offered a chance to put into practice all the skills she’d developed at City. From reporting on the Soham murders to the Rolf Harris trial, flooding in the West Country to the phone-hacking scandal, I’ve certainly had a varied career to date.